I'm an awful blogger friend. I've neglected both it and you guys far too long. I can usually tell when I've been away from my blog longer than usual because I get weird phone calls at all hours of the night with heavy breathing on the other end. I also think it's been secretly watching me sleep and I swear I've seen it flipping me off as it runs around corners. I guess it doesn't realize threatening me will get it nowhere. Another tip off has been the fact I've gotten some pretty amazing emails asking where I am. PS. I totally love you for that. But you know, sometimes one has to put these things aside to return to a semblance of a normal life. Not that I'm saying blogging isn't normal or a normal way of life, but let's face it, my blog isn't going to clean out the garage. It's not going to fold my clothes, dust the baseboards, pull the weeds, and it is certainly not going to clean the ring around the guest bathtub. From three months ago. Ew. Speaking of cleaning, the fun things about having a good sort through is all the crap one can find. As you may know, I'm a SUPER avid garage saler goer, but I don't necessarily enjoy having them. I find people are so darn cheeky. 'Uh, yeah, how much you want for this leather couch? I'll give you 75 cents'. There's negotiating and there's asking for a chair to be thrown at your face. Lucky for me, I've mastered the negotiating skill down to an art and have gotten some pretty good stuff for next to nothing. The key? Don't be insulting. Actually, scrap that. I probably am, they just don't know it. Let's go with a charming personality and a thousand watt smile. It will get you everywhere. I have recently gotten into selling my goods using online ads. I used to sell on networks like Craig's List and Kijiji (which apparently means 'village' in Swahili. Note to self: Add 'Fluent in Swahili' to resume) and had been quite successful at doing so, but the more popular they got, the worse people did as well - constant no shows, dodgy people like 'Hot4GirlsInTrucks@trollsville.ca' asking to pick up items at 11pm at night (Absolutely! Come right on over), or questions like 'Can I come three weeks from 2016 to pick this up?' or 'Can you reupholster these chairs before I buy them? I hate the fabric that's on them.' For serious? There was too much back and forth only to find they were no longer interested. I have since moved onto Facebook pages that are geared to selling items within my area. The fabulous thing about this method of selling is that gorgeous little photo next to the actual name of the interested party; they are held much more accountable for making good on items, especially because people don't like others to know they bailed or stood someone up. It's not really good for credibility, is it? Sorry. I'm not quite sure how I got on that tangent, but I made cake. It's my way of apologizing. Now. Can I interest anyone in coming over to mop my floors? Preheat oven to 375ºF. Grease and flour a 9-inch spring form pan and line the bottom with parchment paper; set aside. In a bowl, combine sliced bananas and granulated sugar, mixing well to coat. In a mixing bowl, whisk together eggs, sweetened condensed milk, coconut milk, cinnamon, vanilla, and butter. Whisk in flour until incorporated. Carefully fold in bananas. Pour banana batter into prepared pan. Bake for 40 minutes or until a toothpick inserted comes out clean. Remove from oven and place on a wire rack. Allow to cool completely. In a medium saucepan over medium heat, melt butter. Add in sugar and whisk until sugar has dissolved, about 3-4 minutes. Remove from heat. Add heavy cream, using caution as it will bubble up. Add in vanilla extract, rum and salt. Whisk to incorporate. Cake itself can be enjoyed warm or cold. Yay! So happy to see you blogging :) I understand needing a break! This cake looks SO unique and so delicious-looooove it! Welcome back! oh and this cake! Knock me down and slap me silly it looks so good! Stumbled upon your blog on Foodgawker. That's a stunning picture. Love the way you write and a few of your recipes have bowled me over like this caramel-rum sauce!! YUMMY! Welcome back, Jenny!!! I've been checking out your blog every week for the past while, hoping to see a new post from you. Of course, I'm too socially stunted to actually email you to ask how you've been. Now I know you've been up to your neck in cleaning (boo) and dealing with the idiots online. I think blogging is a much more fun 'n rewarding endeavour in comparison! I know how you feel though. Sometimes I stress myself out with my blogging commitments and I'm barely doing the minimum here. I just figure that if I disappeared, no one will care and nothing frightens me more than being irrelevant! Anyways, enough ridiculous babbling from me. I'm just glad to see you again (I also just checked out your amazing guest post on Kayle's blog. LOVE the cupcakes, girl!) and this cake looks incredible. 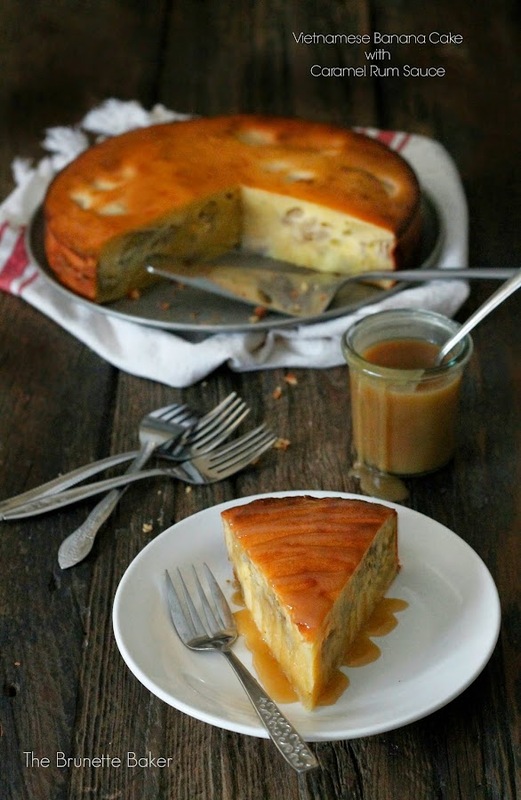 I love banana desserts and that caramel rum sounds good enough to drink. Hi Liz! Thanks so much for the love. I'm still waiting for the day someone invents the Robot-DO-ALL 3000.